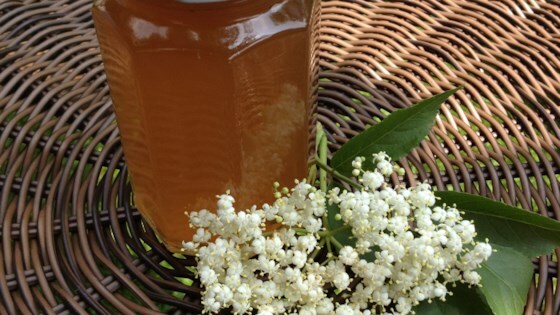 "This recipe uses apple juice as a base to make elderflower jelly. When picking elderflowers, make sure they have not been sprayed by pesticides." Inspect 6 half-pint jars for cracks and rings for rust, discard any defective ones. Immerse in simmering water until jelly is ready. Wash new, unused lids and rings in warm soapy water. Place elderflower umbels into a plastic or glass bowl. Pour apple cider on top so the flowers are fully immersed. Weigh down flowers with a small plate if necessary. Cover and let sit in the fridge for 24 hours. Place a small plate in the freezer. Line a colander with two layers of cheesecloth and strain the juice into a large heavy pot. Add the sugar and heat slowly, stirring to dissolve the sugar. Add the pectin and bring to a full boil on high heat, stirring constantly. Boil for exactly 1 minute, stirring constantly. Remove the pot from the heat. Remove the plate from the freezer and spoon about 1/2 teaspoon of the hot jelly on the plate. Tilt the plate back and forth and wait for a few seconds; if the jelly sets, it has the right consistency. If jelly remains liquid, return pot to the heat, add citric acid and boil for 30 more seconds. Repeat the jelling test. Skim off any foam with a ladle or a large spoon. Pack jelly into the prepared jars, filling to within 1/4 inch of the top. Run a clean knife or thin spatula around the insides of the jars to remove any air bubbles. Wipe rims with a moist paper towel to remove any spills. Top with lids and tightly screw on rings. See how to turn your favorite wine into delicous jelly.